For most of the middle of the 20th century, Charlottesville’s Paramount Theater had taken a leading role in the community. Created by Chicago architectural firm Rapp & Rapp, architects of The Paramount-Publix chain and its flagship theater in New York City’s Times Square, Charlottesville’s Paramount was part of the golden age of cinema. With its Greek Revival-influenced façade, The Paramount’s exterior evokes an earlier time in Virginia’s history. With its octagonal auditorium chamber, delicate detailing, and neoclassical grandeur, the theater honors Charlottesville’s most famous son, Thomas Jefferson. 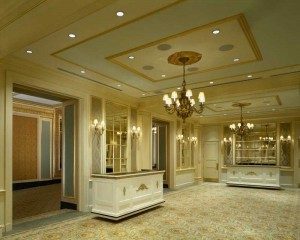 Through details like painted tapestries, exquisite plaster moldings, and brass chandeliers, C.W. and George Rapp created a theater unlike any other they would design – one truly reflective of the community it would call home. Following its Thanksgiving Eve 1931 opening, The Paramount became a landmark overnight. Even though the theater came along during the decline of the American movie palace, and two years after the stock market crash of 1929, The Paramount thrived. As with most Southern theaters of the era, The Paramount operated for many years as a segregated building. The Third Street Entrance, originally intended for use by African-American patrons, is another feature setting the theater apart. With a level of decoration and elegance sized for the smaller scale, but not completely removed (as was often the case), the design of the Third Street Entrance is complimentary to – not divorced from – that of the building as a whole. One of Charlottesville’s premiere destinations, The Paramount made movie-going a special experience. Audiences numbering in the thousands each week would come as much to escape into opulent surroundings as to watch a show. For four decades, the grand movie palace hosted scores of films, war bond drives, fashion shows, cartoons for kids, and popular rock and roll artists, entertaining multiple generations of area families. The Paramount remained Charlottesville’s crown jewel until 1974 when its doors closed for good. Even as the lights dimmed on the marquee, the theater was not forgotten. Almost from that moment, efforts were launched to save the theater from real and constant threats of demolition. In 1992, the non-profit Paramount Theater, Inc. purchased the building. With a grant from the City of Charlottesville, the work began. The initial project – restoring the Main Street marquee – was selected for maximum visibility. After the marquee’s structure and finishes were examined, microanalysis of the paint determined original colors. At midnight on that New Year’s Eve, the marquee’s lights shone brightly on Main Street for the first time in a decade. The Paramount seemed ready to begin life anew. Progress continued with the hiring of Washington architectural firm Martinez & Johnson Architecture, in partnership with Charlottesville firm Bushman Dreyfus Architects. The 16.2 million dollar project includes not only the meticulous restoration of the theater, but also the creation of new facilities enabling The Paramount to step into its new role as a regional performing arts center – a modified fly loft, backstage areas, orchestra pit, and a three-story annex building with computerized box office, ballroom and meeting spaces, and a community rehearsal room. Restored to its former glory, The Paramount Theater opened its doors to the public once more on December 15, 2004 – more than thirty years after it had closed. But, one final piece was missing. Due to the enormity of the restoration, the return of the vertical blade sign could not be completed during the original restoration. As The Paramount approached its tenth anniversary of reopening, the campaign to restore the vertical blade sign was revived. A fitting conclusion to the 16-month tenth anniversary celebration, the illumination of the blade sign took place on December 15, 2015. The blade sign was dedicated to the children of Charlottesville – past, present, and future generations. Since its reopening in 2004, The Paramount has continued to grow and thrive with the spirit of its original mission in mind. In the past decade, the theater has hosted acclaimed artists such as Tony Bennett and Diana Ross, welcomed local performers and nonprofits, screened hundreds of beloved movies, and offered a variety of affordable educational programming. The greater Charlottesville community continues to recognize The Paramount Theater’s cultural and economical significance, awarding it the 2016 Tourism Achievement Award by the Charlottesville/Albemarle Convention & Visitors Bureau; the 2016 Best of C-Ville Award for Best Theatre (Live), Best Place to Watch a Movie, and Best Music Venue; and the 2015 Charlottesville Family Reader Favorite Award for Favorite Movie Theater. In July 2017, The Paramount Theater was awarded the 2017 Outstanding Historic Theatre by the League of Historic American Theatres (LHAT). The Outstanding Historic Theatre Award recognizes a theater that demonstrates excellence through its community impact, quality of program and services, and quality of the restoration or rehabilitation of its historic structure. The award was presented to Executive Director Chris Eure at the League’s 41st Annual Conference which took place in Los Angeles, California, July 16 – 19. The honor of the award received carries significant respect and excitement from colleagues in the arts world. Thanks to the generous individuals who guided the Theater through the decades, The Paramount is again a gathering place for Charlottesville and the region. Because of the efforts of so many – the architects, engineers, contractors, contributors, staff, volunteers, and of course the wonderful community who has shown such enduring support – The Paramount Theater is not only a place to remember the past, but to celebrate the future.